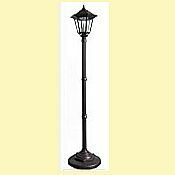 The Windsor Solar Lamp Post is a classic design that is perfectly practical for illuminating your patio, pool, or deck in style. This energy efficient solar powered lamp post automatically turns on at dusk and off at dawn. It also features a manual Hi-Lo brightness switch so you can set the amount of light you prefer. It has 5 super-bright white 10mm LEDs to light up the surrounding areas. The Windsor Solar Lamp also has a new, efficient Li-Ion rechargeable battery for long battery life. The patented cone reflector technology creates the brightest light possible. 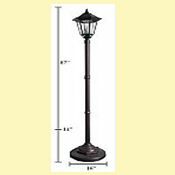 Constructed of durable, rust-resistant, powder-coated cast aluminum, the lamp stands 87 inches tall and has a 16 inch diameter base. Available in black finish.